Need a hand? You won't be breaking any anatomy body parts. Skeleton Gloves are black with a realistic bony x-ray structure printed in white. Complete any scary skeleton or ghostly horror costume with this comfortable, light stretch, black poly knit, boney Teen to Adult Skeleton costume accessory. Black 100% polyester adult sized gloves feature white detailed skeleton hand and finger bones. Go Goth and get all ghostly with these cool costume accessories - bone up on handiwork and lend a helping hand to grab as much candy as you can in these cool gloves! 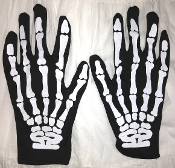 Create or complete your gothic or anatomy costume with these spooky black and white Skeleton print gloves. Sized for teen thru adult men’s medium, they are sure to complete your Halloween, gothic, cosplay or pirate costume. *Please Note: These do NOT glow. Hand wash only. Do not use bleach.